KNHBF - ICC International Cannabis Corp.
A new Bloomberg article says “Pot Is So Hot” that Canadian MJ companies are importing a workforce to help meet the surging cannabis market. College campuses are now helping to fill shortages. Giant multi-national conglomerates like Philip Morris are rushing to get involved while the industry is still “ground floor”. Simple, because by 2025 the global legal MJ market is expected to reach $146.4 Bln. ... as well as a “Red hot pot stock” by editors of other periodicals. That’s a run of 108%. 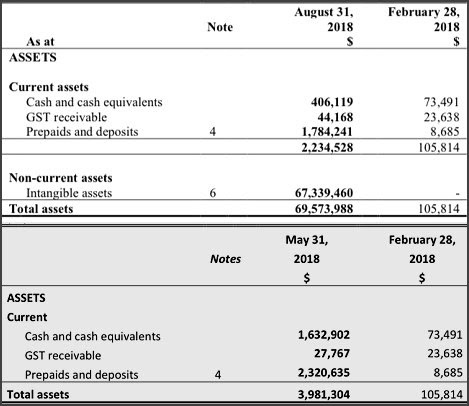 In other words, WRLD’s assets have grown over 65K% in this year. WRLD specializes in the acquisition of marijuana projects and cannabis-related companies. Through its subsidiaries, the company has agreements in place for European-based pharmaceutical distribution, wholesale importation, research and development, as well as working interests in industrial hemp licences in Greece, licences to cultivate, produce, distribute, store, and export Cannabis and Cannabis derivatives in Colombia, the Kingdom of Lesotho, Africa and Denmark. In their update ICC announced they had engaged an Israeli Cannabis organic cultivation and management company, Sababa Sciences Inc. to provide end-to-end management including the implementation of advanced Israeli agricultural technologies for high quality medical Cannabis treatments. ICC and Sababa Sciences have designed a 473,000 square foot, fully automated greenhouse facility that will meet IMC-GAP, ISO: 9001 and European GMP standards. Finished Cannabis and Cannabis derivatives produced by ICC will be sold through Denmark’s retail pharmacy network. The first week of October ICC announced they had commenced construction of its Colombian Cannabis Centre of Excellence (COE), which will serve as headquarters for their flagship property (the “Cannabis Park”) located in the heart of the Bogota Savannah in Funza, Colombia. Once complete, the COE will act as a collaboration facility, where renowned industry growers, geneticists and service providers can assemble and pursue revolutionary Cannabis centric projects and initiatives. ICC holds licences to cultivate, produce, hold, sell and export cannabis and its by-products. Important to remember- Colombia has become a highly sought-after jurisdiction for cannabis cultivation activities as it has a world-leading combination of broad public and private sector acceptance, ideal growing conditions, and a massive addressable market. ICC’s Colombian Cannabis Park is forecasted to produce between 25,000 and 40,000 kilograms of dried Cannabis flowers per year. Once fully optimized, ICC’s Colombian assets are projected to generate up to 500,000 kilograms of dried Cannabis flower per annum. Less than a week later ICC announced they had been granted a medical cannabis cultivation licence by the Greek government, superseding and augmenting its existing Hemp license. The licence grant is a conditional pre-approval for medical Cannabis cultivation in the Greek prefecture of Imathia. ICC controls a 16-acre land package situated in northern Greece, which will be dedicated to medical grade cannabis cultivation, extraction, distribution, as well as research and development. As has been noted, ICC's distribution network of approximately 35,000 pharmacies throughout 16 countries will complement the company's Greek cultivation capabilities. ICC followed this news up with another big announcement- they acquired Polannabis Holdings. Polannabis, through its subsidiary, controls a Polish hemp processing and extraction licence. The licence permits the extraction and manufacturing of CBD derived products from hemp. Polannabis has access to over 850 acres of premium hemp crops; estimated to produce up to 6,800 tons of material for CBD extraction. ICC’s immediate investment in Polannabis will increase its CBD extraction capacity to an initial run-rate of over 2,400,000 grams per year, prior to the Phase II build out which will begin in 2019. Poland is the sixth most populous EU member state and collectively with Greece will function as ICC’s flagship European hemp cultivation and extraction hub. The EU has over 500 million potential consumers, affording ICC with a unique opportunity to service this high growth marketplace. The acquisition of Polannabis provides ICC with immediate revenue generation and the ability to leverage its European distribution network. At the start of November ICC announced a strategic partnership with GreenTree International Inc., parent company of Amercanex in which the companies will collaborate to deploy Amercanex’s revolutionary ECM across all of International Cannabis’ present and future operational jurisdictions, thereby creating the International Cannabis Exchange. In a nutshell the partnership affords International Cannabis the ability to facilitate the wholesale distribution of their product offering on Amercanex’s ECM. Amercanex’s ECM platform will allow International Cannabis to assess product availability, facilitate real-time transactions and improve inventory management, while reducing overall expenses and increasing regulatory compliance and auditability. International Cannabis will utilize Amercanex to expand its customer base, augment existing partnerships and collect industry data resulting in improved data-driven marketing and product decisions. One week later ICC announced what may be their biggest news, they received an inaugural purchase order for 10,000mL of Tetrahydrocannabinol Cannabis oil, 5,000g of dried Cannabis flower and 5,000mL of CBD oil. The initial Purchase Order is scheduled for distribution during the first quarter of 2019. International Cannabis expects to receive subsequent Purchase Orders throughout 2019. The Company will also commence a dedicated European sales campaign, with the objective of augmenting impromptu, inbound demand. International Cannabis will market and sell its Cannabis and CBD products throughout the 28 eligible member states of the European Union (“EU”). The EU has over 500 million potential consumers, affording ICC with a unique opportunity to service this high-growth marketplace. As a follow up to their efforts in Colombia ICC reported they had successfully completed its Colombian Agricultural Institute (“ICA”) Cannabis inspection. ICC just kept the action going, announcing only a few days later that they had entered into a definitive agreement to acquire 100 per cent of Enigma Unipessoal Lda. Enigma controls one of the first hemp licenses to be issued in Portugal, which permits the cultivation, processing and import/export of hemp-derived products. Enigma successfully harvested and extracted its first hemp crop in 2015, and has become a notable importer of proprietary hemp seeds. This licence authorizes International Cannabis to cultivate hemp on 400 acres of fertile agricultural land located in the Castelo Branco region of Portugal. The Company’s Portuguese hemp operations are estimated to yield 45,000 kg of finished, extracted pure cannabidiol (“CBD”) isolate product per annum, and a full operating team and infrastructure is in place. And now, most recently, ICC announced they had entered into a definitive agreement to acquire 100 per-cent of Green Gene Research Inc. which boasts 17 years of experience in the fields of Cannabis research, testing, cultivation, as well as the optimization of proprietary seeds and strains. Green Gene controls a portfolio of over 120 laboratory-tested craft Cannabis strains. These unique craft strains will allow for the continued differentiation of the International Cannabis brand, in an increasingly generic and homogenized market. Green Gene’s strain and seed inventory has been curated and assembled over the past 17 years by a team of experiences geneticists and breeders. The acquisition of Green Gene positions International Cannabis to realize multiple revenue streams using its unique genetic catalogue. And that’s not where WRLD’s global efforts end. WRLD has also entered into a definitive agreement with Aricannabis BioTech Corp. to acquire 100% of Aricannabis’ issued and outstanding shares. Aricannabis works on an exclusive basis with NuCare Health to provide Cannabis products to over 2,800 independent and corporate pharmacies across South Africa. South Africa has a population of 55 million people and have announced plans through the Medicines Control Counsel for medical Cannabis distribution to South African patients. The Kingdom of Lesotho has signed numerous international trade agreements permitting the unencumbered export of Cannabis products to various jurisdictions worldwide. This is so important because less than a handful of countries currently allow the legal export of cannabis. WRLD’s operations in Lesotho create numerous opportunities for new markets across Africa as well as Europe. It’s no wonder that they recently announced the completion of a strategic investment and entered into a commercial rights agreement with Auxly Cannabis Group Inc, one of the most respected names in the Cannabis industry today. Terms of that investment include Auxly subscribing for $5,000,000 of senior unsecured convertible debentures of WRLD by way of a non-brokered private placement. WRLD has said they intend to use the net proceeds from the Investment to begin its growth and development under the strategic alliance with Auxly, as well as for working capital and general corporate purposes. We are on the cusp of an MJ revolution and WRLD is front-and-center in the global market and has clearly shown that they are determined to continue growing. You would be hard pressed to find another company that has been as busy as ICC International Cannabis Corp. over the past several months; since the end of last month the chart too has started to heat up. Since dipping to recent lows, WRLD & KNHBF have climbed back these past two weeks. As we mentioned at the start, for KNHBF’s that was a 108% run. WRLD has a 52-week high of $0.91 and a 52-week low of $0.25. KNHBF has a 52-week high of $0.90 and a 52-week low of $0.11. We urge members to take Swift Action, start researching (CSE:WRLD)(OTC:KNHBF) right away. This is not a profile you want to miss. As always, please start your research on KNHBF right away and enjoy. JS Media has received five thsnd dlrs via a b.ank w.ire for the awareness of KNHBF. We previously received fourty thsnd dlrs via a b.ank w.ire for the awareness of KNHBF which has since expired. Any type of reproduction, copying or distribution of the material in this email is prohibited without a written consent from the site owner. This newsletter is a paid advertisement and is neither an offer nor recommendation to buy or sell any security. We hold no investment licenses and are thus neither licensed nor qualified to provide investment advice. The content in this report or email is not provided to any individual with a view toward their individual circumstances. This c.ompensation constitutes a conflict of interest as to our ability to remain objective in our communication regarding the profiled company. Owners or employees of StockHideout, may buy and sell shares at the open market at any time during this email program. Because of this conflict, individuals are strongly encouraged to not use this newsletter as the basis for any investment decision. StockHideout is not responsible for any losses you may incur while using this newsletter and its services. If you do not agree with this statement then please leave this service immediately. AGHI - Agora Holdings Inc.
Get HOT ALERTS on the go with our FREE SMS Alert service. SMS Alerts are Instant and 10 times faster than EMAIL. Putting you first inline beyond other Investors. No headache No Spam No BS. Guarantee your outcome that much more by joining our SMS service below. Enter phone number and Start Right Away. Disclaimer: SMS/Text Message charges subject to your cellphone providers fees. Please check with your cellphone plan provider for details and pricing. Alerts are issued as opinion and should no be used as guides for when to trade stock. OTC Fire is not a licensed financial adviser. Please consult with your licensed financial adviser before trading stocks.